Mastitis is the most expensive problem in the dairy industry, costing over $2 billion a year. There is a growing concern for antibiotic resistance due to use of antibiotics to battle mastitis infections. 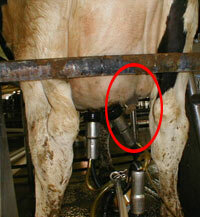 The damage and pain inflicted by conventional milking machines leads to mastitis. Mastitis is an infection of the udder caused by bacteria (e coli, Staph aureus, other). Mastitis causes elevated white cell counts in the milk with typical levels of 80 million in a typical serving of milk. Normal levels are 25% or less those of the typical values. Processing of milk does not eliminate the white cells present and does not ensure elimination of harmful endotoxins produced by Staph aureus. Dairy farmers are forced to rely on artificial hormones to battle the problems caused by conventional milking machines. Dairy farmers must also use a variety of antibiotics to address the recurring infections leading to concerns for creation of antibiotic resistant strains of bacteria. The use of antibiotics in the dairy industry is primarily to combat mastitis. The typical dairy cow survives just over two years producing milk before being slaughtered as a result of mastitis and udder destruction from milking machines. The productive life expectancy should be many more years. A variety of germicide teat dips are used to combat mastitis. The teat dips are applied before and after milking with trace amounts ending up in the milk. Mastitis is recognized as the most significant and costly problem in the US dairy industry. This cow has been milking for less than two years and has had mastitis infections so severe that the right rear teat has been destroyed. Note the dead teat flesh hanging from the udder and the severely deformed udder.